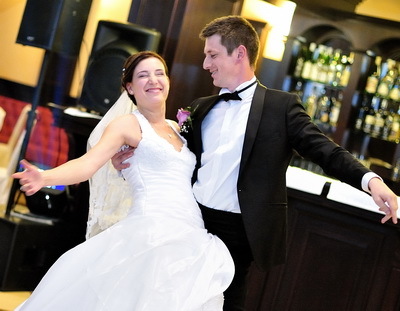 Bianca and Stefan have known each other for almost five years when they decided to make the big step and get married. 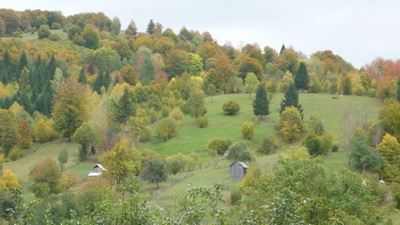 Their wedding was in the fall, in October at a venue in the mountains, so they were able to take advantage of the colors of the forest in autumn. The day started perfect. The wedding was very well planned, up to the slightest detail so Bianca and Stefan weren’t stressed at all. By noon they started to get ready for the ceremony. Bianca dressed up with her wonderful gown while Stefan put on the tux. They decided to give buttonholes to their parents and to their godparents. 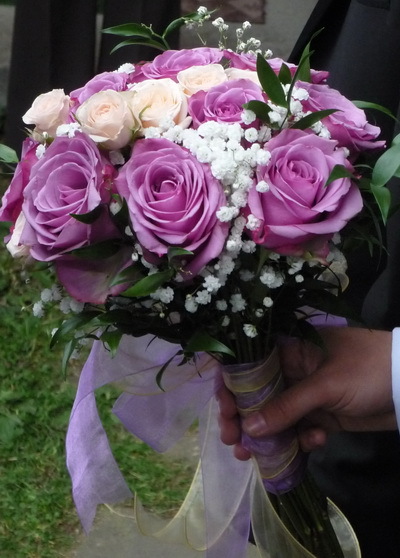 As the wedding colors were purple and cream, the bridal bouquet was made of purple and white roses and tied with purple and cream ribbons. I caught the bouquet and I can tell you it kept its fresh smell for a few days. Bianca and Stefan are orthodox so the religious ceremony was a little different that the ones we are used to. 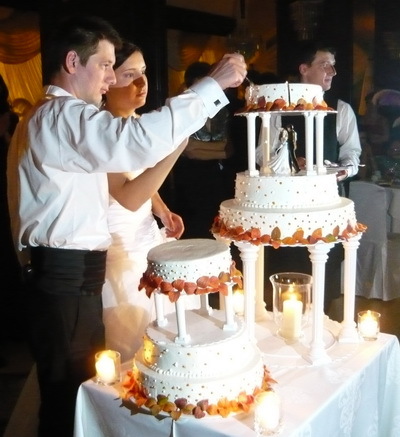 The bride and groom have to choose a couple as godparents and the godparents have to keep lighted candles during the entire ceremony as a symbol of the union that is being created. The priest officiating the ceremony will put two special crowns on the heads of the bride and groom as a symbol of power and purity. The wedding reception was at the restaurant of a hotel. 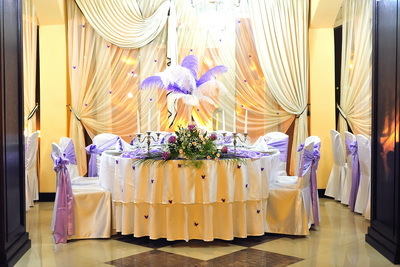 The happy couple’s table was very elegant decorated in white and purple. 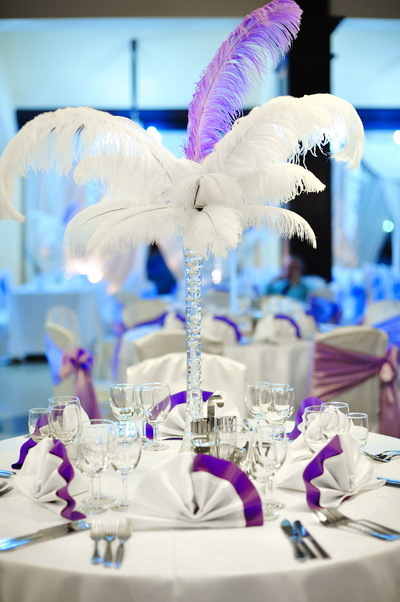 The other tables were also very careful arranged, and had feathers bouquets as centerpieces. It may sound a little extravagant but it was quite elegant and simple. They had a choreography prepared for their first dance and a Viennese waltz and although they were a little shy, they managed to make a very good impression among the wedding guests. The cake had a Greek inspiration. It was a multilayer cake but it had Greek columns to sustain the layers. The most amazing thing about the cake was that it looked as it was going to fall at any moment. But in reality, it was very stable. The cake was seasonally decorated with orange leaves. 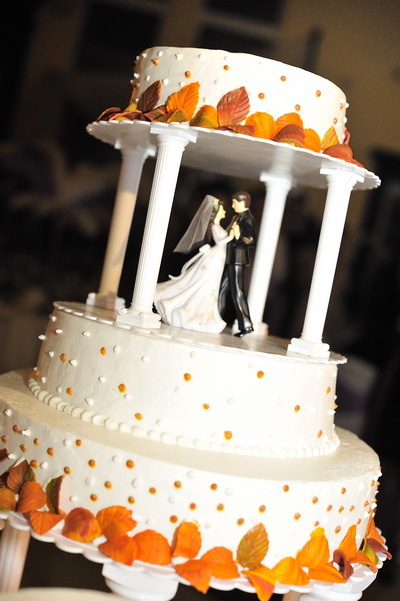 The cake topper was simple, showing a cute bride and groom couple. For their honeymoon they went to Italy. Each of them took a backpack and they made a short tour of four cities in Italy. They visited Rome, Milan, and most important Venice.